Washington, D.C. – Today, the Presidenial Commission on Election Administration (PCEA) released their report to President Obama outlining how to improve the administration of America’s elections. The League submitted testimony to PCEA in September 2013 that urged the Commission to consider a five-point reform agenda as part of its recommendations. “Our initial reaction is that there are many good recommendations in the PCEA report and others that we will need to look at more closely to examine the real impact on American voters,” said Elisabeth MacNamara, President of the League of Women Voters of the U.S. “For example, the recommendation for all states to provide for in-person early voting is an important and very positive step,” she said. “While the League is enthusiastic about online voter registration, the accessibility of these systems continues to be a major concern” noted MacNamara. “The League’s testimony urged the Commission to recommend online voter registration systems designed for all eligible citizens,” said MacNamara. “But a weakness of the report is the endorsement of online registration systems that many eligible voters can't use,” MacNamara said. “Of the systems in the Commission’s report, voters must have a driver’s license or a non-driver’s ID in order to register to vote online. This limitation is unnecessary, will substantially reduce the effectiveness of online registration and also raises concerns about the discriminatory effect,”added MacNamara. “We look forward to working with Commission to implement the best of these recommendations and improve how elections are run across this nation,” concluded MacNamara. The Presidential Commission on Election Administration issued recommendations today to improve the voting experience and reduce long lines. “The Commission’s recommendations are a significant step forward,” added Wendy Weiser, Director of the Democracy Program at the Brennan Center. “They make clear that nationwide our voting systems have common problems, which can be fixed with common, national solutions. Especially important is the consensus that we need to modernize voter registration, make early voting available to all Americans, and put systems in place so no one waits longer than 30 minutes to vote. These will be the new benchmarks against which future elections will be judged. The Brennan Center’s recent report How to Fix the Voting System, outlines four ideas to improve elections. Also see more on our signature proposal, Voter Registration Modernization. Washington, DC - Today, Rock the Vote released a field-tested suite of online voter registration (OVR) tools and a game-changing white paper -- Connected OVR: A Simple, Durable Approach to Online Vote Registration -- which charts an innovative new approach to the way Americans register to vote. These new tools are being made available free of charge at Rock the Vote’s new online resource center to support election administrators nation-wide in adopting sustainable online voter registration systems. Rock the Vote’s white paper, written by Robinson + Yu with support from the Ford Foundation, argues for a future-proof approach to online voter registration that engages not just elections officials but universities, technology companies, government agencies and civic organizations in promoting registration to their audiences, and submitting them to the State digitally. This concept of allowing voters to complete the voter registration process in designated places beyond a .gov website, is used widely in other government processes such as tax filings where the IRS contracts with companies like H&R Block to assist individuals and submit their taxes directly. In addition to the white paper, Rock the Vote also released today tools to facilitate online voter registration on any election’s official website, a complete technology solution developed in partnership with the TrustTheVote Project for a state-wide online voter registration system, and other resources to support the ‘connected OVR’ approach. These tools and technology solutions have been tested by Rock the Vote and its partners and helped more than 6 million voters complete registration applications. Today these free, customizable tools are available for any state or local election administrator and are featured in the new online resource center for elections officials at RocktheVote.com/OVR and on the Presidential Commission on Election Administration’s website. Rock the Vote’s online voter registration tools are available in English, Spanish and will soon be released in twelve Asian languages. The white paper and Rock the Vote’s online registration tools are featured prominently in the bipartisan Presidential Commission on Election Administration’s report, which was released earlier today after 6 months of research and public hearings. 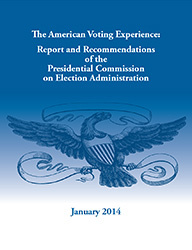 President Obama established the Commission following his 2013 State of the Union Address to tackle the problems of long lines and other hurdles faced by voters on Election Day in 2012; it’s report details a variety of changes that elections officials can make to improve the way Americans register for and participate in elections. Rock the Vote provided testimony and worked closely with the Commission and its members particularly as it relates to online voter registration (OVR) - a concept it has been studying, testing, and building tools to support for nearly two decades. Rock the Vote’s white paper and online voter registration tools are available at no cost to support elections administrators in implementing the Commission’s recommendations. Rock the Vote has been in the voter registration business for nearly 25 years – having run the largest non-partisan voter registration drives in the last six presidential election cycles. Rock the Vote president Heather Smith is available for media interviews. When millions of Americans stood in lines for hours to vote yet again in the 2012 elections, President Obama recognized that “we need to fix that.” Today, the Presidential Commission on Election Administration released a report with their recommendations on ways to improve election administration. The Commission’s recommendations are welcome but much more work remains to be done to ensure every eligible voter can exercise their right to vote. “This is an important step forward to realize the dream of equal opportunities for political participation for all Americans. We can and must improve our election administration so that the voices of all Americans can have an impact in our politics and policy making. The Commission’s recommendations are a good first step, but to fully protect the freedom to vote for all eligible voters, Congress must act to pass the Voting Rights Amendment Act,” said Miles Rapoport, President of Demos. While the policies called for by the Commission represent a baseline, we must go further to engage all citizens in the political process by facilitating participation, removing unnecessary barriers, and ensuring racial equity within our electoral system. Demos calls on all states and localities to move quickly to adopt and implement these solutions, and on the federal government to provide support and incentives. “It is often difficult to find agreement in this fraught political environment, particularly in the area of election administration. The Presidential Commission proves that serious-minded people from both sides of the aisles can find common ground when it comes to creating the election system the American people deserve," said Gerken. WASHINGTON – A report was released today entitled “The American Voting Experience: Report and Recommendations of the Presidential Commission on Election Administration.” The bipartisan Commission was announced by President Obama during last year’s State of the Union Address. Its mission was to identify non-partisan ways to shorten lines at polling places, promote the efficient conduct of elections, and provide better access to the polls for all voters. "Regardless of party, Americans agree that long lines on Election Day are unnecessary, are a hindrance to exercising the fundamental right to vote, and must be addressed. We appreciate the President’s initiative in forming this bipartisan commission and welcome their thoughtful and specific recommendations to fix the problem of long lines and other voter access issues. Overall, these are a series of recommendations that make sense, but we have to analyze them comprehensively both for their civil rights and privacy implications. We welcome efforts to improve election administration in this country, which is woefully out of date in far too many jurisdictions." The release of these recommendations comes on the heels of last week’s congressional introduction of the Voting Rights Amendment Act of 2014, a bill in response to last year’s Supreme Court ruling in Shelby County v. Holder. Note that the bill and the recommendations around election administration address separate issues. While addressing election administration is critical, it is imperative for Congress to act this year to protect voters from discrimination in a common sense, bipartisan way through passage of the Voting Rights Amendments Act. “USACM commends the Presidential Commission on Election Administration for focusing on technology as a critical aspect of modern voting systems. The Commission’s recommendations on several key areas reflect policy positions that USACM recommended to the Commission, and has promoted in other venues to meet the significant election requirements of reliability, responsiveness, security, privacy, auditing, and accessibility. - Modernization of voter registration by the states through continued expansion of online voter registration and expanded state collaboration in improving both accuracy of the voter rolls and efficiency in the registration process. - Investment in voting technology to reform the standards and certification process for new voting technology to address soon-to-be antiquated voting machines, and to encourage innovation and the adoption of widely available and significantly less expensive off-the-shelf technologies and “software-only” solutions. - Assuring that polling places are accessible to all voters and are designed to function smoothly so that they are usable for every citizen through the entire voting process. - Conducting post-election audits of voting equipment and publicly disclosing data on machine performance in a common data format to allow ballots to be recounted accurately and without revealing voters' individual choices. - Improving the ability of military and overseas voters to access ballots and other voting materials through increased use of the Internet, although Internet voting is not sufficiently secure for use. It can, however, be an effective method for communication with these voters. Jeremy Epstein chairs the USACM Voting Committee. He is a senior computer scientist with SRI International. He holds an MS in computer science from Purdue University. Read more information on the USACM voter registration database report. Read more information on the USACM position on electronic voting. Read more information on the USACM internet voting brief. Read the USACM letter to the Presidential Commission on Election Administration. With more than 100,000 members, ACM (Association for Computing Machinery) is the world’s largest educational and scientific computing society, uniting computing educators, researchers and professionals to inspire dialogue, share resources and address the field’s challenges. The ACM U.S. Public Policy Council (USACM) serves as the focal point for ACM's interaction with U.S. government organizations, the computing community, and the U.S. public in all matters of U.S. public policy related to information technology. WASHINGTON -- On January 22, 2014, after nearly a year of meeting and deliberating with stakeholders from across the nation, the nonpartisan Presidential Commission on Election Administration (PCEA) released their report and recommendations spelling out specific steps that can be taken to improve election administration and accessibility. Compliance with existing laws like the Americans with Disabilities Act (ADA) and the Help America Vote Act (HAVA) remain inconsistent and inadequate. Enforcement must be strengthened. Election authorities should establish advisory groups that include voters with disabilities in meaningful and significant ways. NCD concurs. As recommendations are adopted and enacted, NCD also urges the Administration and Congress to take steps to ensure that states do not institute restrictive requirements which disenfranchise voters – including those with disabilities – by adding undue burdens such as requiring photo identification, repealing same-day registration, requiring proof of citizenship, reducing early voting sites and/or early voting schedules, and limiting the restoration of voting rights. Moreover, NCD reiterates the need for state legislatures and local rulemaking authorities to conduct thorough reviews of existing guardianship laws and modifying them where necessary to ensure that all people with disabilities will have full access to the right to vote independently, alongside their non-disabled peers. Meaningful checks and balances must be put in place to ensure that every state and locality move quickly to adopt and implement the solutions put forward by both NCD and PCEA. The Administration and Congress must also do their part to provide the necessary supports and incentives to make the recommendations highlighted in PCEA and NCD’s reports a reality.